One of our favorite Boulderwood luncheon concoctions is the frittata especially since we have farm fresh eggs and our bountiful CSA harvest. For this anything-goes-omelet concoction I sauteed our garden grown onions with zucchini and summer squash in olive oil until they are golden and slightly caramelized. When putting oil into the pan to heat up be sure to swirl it all around so all sides are covered. 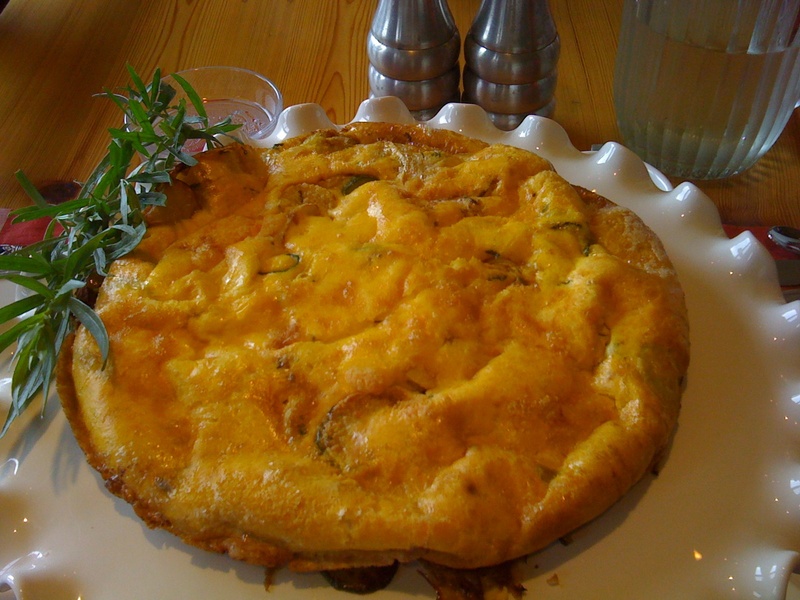 The frittata will come out so much easier for you. While those cooked I whipped 6-8 eggs (depends on your frying pan size). Once the veggies were caramelized I added fresh herbs (tarragon, basil, parsely combo) and chopped garlic. Here's a great garlic tip! Mash a 1/4 teaspoon of salt into your chopped garlic then add to the saute mix until it gets aromatic and then add eggs. This will prevent burnt garlic syndrome. Keep the stove top on low for 3-5 minutes until it cooks all the way through (don't let it get too brown!) If you are a cheese lover like us now would be the time to sprinkle some cheese on top and broil it in the oven for 2 minutes. Once you take it out of the oven it should slip right out of the pan for you. Set the table, bring out some fruit, get everyone seated and enjoy! While farmer Val is making her way back down to Florida for the remainder of the summer and then to Sweden we are happy to introduce the newsletter from one of our favorite Berkshire CSAs, Farm Girl Farm, that is written by our next favorite farmer gal, Laura Meister. We hope you enjoy Laura's insights and delightful recipes that of course include in season ingredients! I may have mentioned before that I often read last year’s corresponding week’s newsletter before writing the current ones, and when I looked back at the one I wrote a year ago, it was all about the loss of our dear tomatoes. Thank the harvest gods that it has been a very different year. But the pathogens that cause Late Blight are around in small numbers this season, and we have been warned to take precautions. We are spraying an organically approved fungicidal copper on our tomato plants—we started yesterday and will work our way through all 40 beds throughout the week. Its not much fun—the stuff is supposed to be non-toxic in such small doses but still, it feels kind of yucky to work with, and it is incredibly time consuming—I estimate it will take 20 person hours to spray all of our plants. And if it should rain or if the warnings continue, we’ll have to do it AGAIN in another week. Hard to conceive of how we’ll find the time. But given the spectre of another total crop loss, I’m spraying. You should know that we will wait the recommended 24 hours before harvesting any tomato that has been sprayed but I do recommend that you rinse your tomatoes when you get them home, just to be extra safe. For more information about Late Blight and the copper funcigide (we’re using Nu Cop), please see http://www.umassvegetable.org and click on Late Blight Alert. This is a very informative website with links to other relevant sources. In other news from the field, I’m excited to begin to welcome the real summer veggies into our lives—we’ve got peppers beginning, as you see in your share, and eggplant trickling in, and we have seen one or two ripe tomatoes out there as we’ve been making our rounds. . Its such an exciting and colorful time of the season! All of these crops are grown in our field across Pumpkin Hollow Road, which you can see from Rt. 71 if you’re heading west and remember to look down and to the right. Meanwhile, we’re turning over the “home field,” the one you see when you pick-up your veggies. We’re pulling all of the garlic, we’ll cure it in the greenhouse, sort the best and the brightest out for seed, and store and distribute the remainder for the rest of the season. We’re mowing down the crops that are finished for now, and we’ll rent a burly rototiller for a day or so and turn over all the vegetable residue and prepare the beds for the fall plantings. We’ll do more beets, carrots, turnips, radishes, bok choy. And we’ll also try a few things we didn’t do in the spring—broccoli raab did well last fall so we’re going to do more of it this fall. We’re trying again with the broccoli, too—this spring it got so hot so fast we lost a lot of it to the heat (it bolted) and the weeds. Speaking of weeds, we are definitely in need of helping hands—we have some beds of kale which are rather engulfed but which are otherwise healthy and harvestable throughout the season. We’d like to keep these crops going and haven’t been able to keep up with all of it ourselves—give us a call if you’ve got a few hours and would like to get your hands dirty! Enjoy the veggies this week. VEGGIE NOTES JULY 27, 2010. 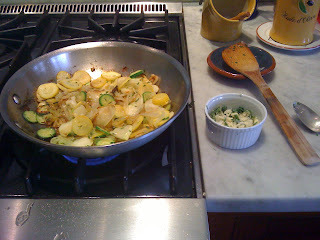 In a large bowl stir together zucchini, eggs, granulated sugar, oil, and vanilla. Add flour, cocoa powder, baking soda, salt, baking powder, and chocolate chips; stir until combined. Spoon batter into prepared cups, filling about half full. Bake about 25 minutes (about 15 minutes for mini-cupcakes) or until a wooden toothpick inserted near centers comes out clean. Cool in pans on wire racks for 5 minutes. Remove from cups. Cool completely. Frost with Peanut Butter Frosting. This a light, cooling summer salad. Double or triple quantities for a great potluck dish! Today Heirloom Meals Radio hosted the Fab 3, also known as the Aronson women. Leni and her two daughters, Steffi Karp and Lisa Newmann joined Carole for a hour long celebration of their family's Jewish-American food heritage complete with noodleful secrets and U.F.F.O. (Unidentified Flying Food Objects aka "hovering" food) tales. Today's show was an excellent reminder of the power of sharing meals together as a family and how our relationships with food and each other can continue to impact lives positively and deliciously. Leni imparted some wisdom that, "A guest is a gift from God!" so keep your ears, mouths and hearts open as you listen in on this fabulous Heirloom Meals chat. The Japanese Beetles have arrived and are congregating among Boulderwood's flowerbeds and lawn! It is too bad that they are such pests because their colors are quite extraordinary and fun to look at. Obviously native to Japan, these insects have no natural predators in the States so they can run amuck on plants like rose bushes, hops, grape vines and more by eating away the leafy parts. According to some online sources, garlic, chives, catnip or soapy-water spray are some homemade deterrents for the Japanese beetle if you aren't into chemically insecticides like us and want to get rid of them. Here, we actually don't mind insects so much. The only spray we use on the farm is copper sulfate to prevent blight on our precious tomatoes. With that said, enjoy your stay in the Berkshires, beetles and bug buddies! The Three “F’s”: food, family and friendship. I am reflecting on the weekend gone by and trust me the beach and the environs were lovely but the memories I carry with me are of food, family and friendship. Food was and is a central theme to any gathering at my parents house and not surprisingly, I enjoyed a weekend with my Mom, Dad, sister and best friend, Anne Marie DeFreest - making and eating amazing seafood. Friday night - fresh scrod baked with a garlic scape pesto, Saturday night - lobsters with homemade cole slaw and Sunday night - fettucine with a tomato pesto cream sauce with leftover lobster chunks. 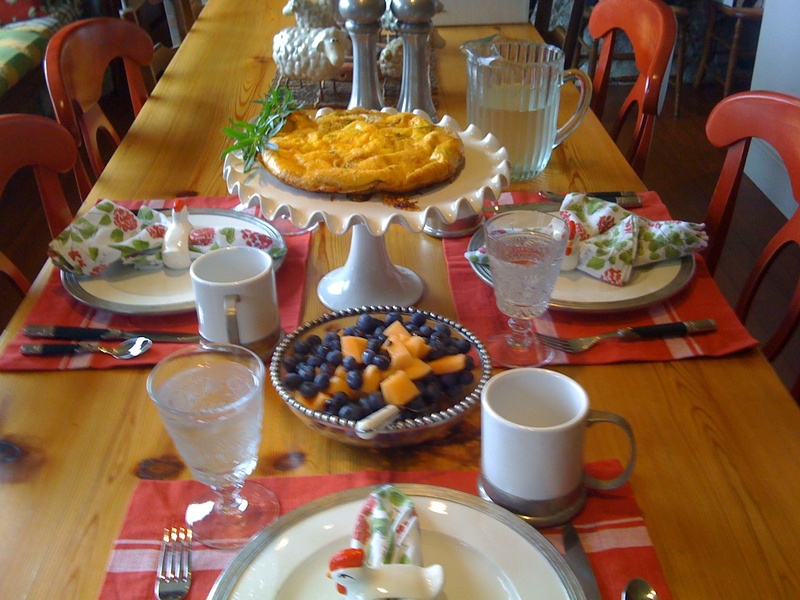 Yep - all concocted, all delicious but all eaten and shared at a loving table. And now I put out into the universe...please take care of Anne Marie - send prayers and love - she's having surgery tomorrow and I want her to know I love her and am sending every positive vibe I can muster up!! I am counting on you for our "old age" home!!! Taking a road trip to the beach is the ideal concoction for this weekend. On the menu will be shopping with mom, Girl with the Dragon Tattoo, fresh seafood and toes in the sand. We suggest whipping up a similar delight. It's summer, enjoy it!